What is Writer’s Block? To put it into simple words it is a condition where a writer is unable to produce new work for whatever reason. Now, there can be several reasons for a writer to get involved in such a condition – genuine, or lame. The hard fact is one has to get over it as soon as possible, else ruin, or at least temporarily put a halt on one’s career. Now, to overcome what we’re referring to as writer’s block, the foremost thing that we need to understand is – why we are facing this situation. 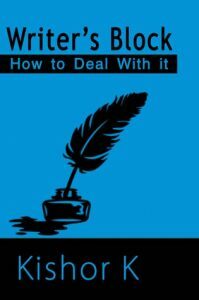 Here I will detail some of the conditions leading to writer’s block and their remedies. Write a short description of first thing you see after reading this post. Write about the person you love the most, or hate the most. Join a fanfiction site, and build a story upon existing characters. Join a website offering writing prompts, choose the one that suits your taste and get on with it. Ask your friend(s) for a random topic, and write about it without a second thought. Let me tell you an incident when I asked a friend to give me a word upon which I had to build a poem. The word she suggested was Rubber band. After a bit of thinking, and with a fear of letdown to drive me through, not only was I able to create a poem about Rubber Band, I was so pumped up after that accomplishment, I wrote five more poems about similar objects. By the end of the fifth one the creative part in my head was awakened and I had many ideas for my next story. In the end, when you’d get over with this condition you’ll realize that while this might be the most common problem, it is also the easiest. Another common problem faced by writers is when they have too many ideas in their mind and none of them seem to progress. It is only natural that a human’s abilities are limited and to think upon many ideas at the same time and put them to results is impossible. In most circumstances writers would end up abandoning all ideas one by one, the good ones because they couldn’t get ahead with it, and bad ones because they had no heart into it. Now, the question is how do we get over with such a situation? Write down all the ideas somewhere, and forget about them for a year or more. You have to accept that if you haven’t progressed with them until now, then it’s unlikely you’d do that in near future. You might want to get back to them later on when you’ve a changed perspective and, probably, more experience. A good thing related to this situation is that you’re not short on ideas, which means your mind is working in the right direction. Wait for a few days and a worthy idea shall strike you soon. Some writers might have their way with the outlines, but not everybody finds it a piece of cake. First thing is to create an outline; second thing is to be able to walk on it without deviation. However, what if you’re progressing with the outline, and you land up somewhere after which you are unable to cross through. Amongst other causes, a major basis of such a problem might be that your outline may be faulty, and, either you’re unable to recognize it, or too loyal to it to accept the fault. For example, there is a scene Y that connects scene X and scene Z. The problem is scene Y either drags too far from X to return back, or too messed up to be able to connect to Z. What can you do? Be honest, and be wise. Let go of your beloved outline, chop off the scene Y and replace it with something better. Or, you might even add another scene in between that could make things better, simpler and clearer. Another scenario can be when you’ve lost your interest in the scene Y because it is boring, or you can’t find yourself attached to it. The question here is, if you think it’s boring or unattractive, don’t you think your readers would feel the same? They certainly would. Thus, what you need to do is to get rid of it and find a better substitute for it. PS: Write so that it invokes emotions within you and your readers. Sometimes, especially when you’re not a fan of outlines, you might find yourself confused and out of clues about the future of your story. In fact even when your progress was absolutely fired up the previous day, you might find yourself completely out of ideas the next day and be trapped between a rock and a hard place. To get yourself through this situation what you need to do is sit down, calm yourself and think it through. It is a good thing to look into the future of your storyline, and act accordingly. Set a few goals for the story and then try to build possible paths to reach there. In short, create an outline. If you’re finding it hard to get that outline too, go back and read what you’ve already written. Rediscover your plot and character. Know what they need. Learn what is best for them. When you do that, you’ll have answers to your dilemma. PS: Sometimes it’s a good thing to take a break. This is probably the worst condition and would leave your hurt and frustrated and tangled. And, yet it happens all the time, especially when you’re writing on the go with no proper outline. What can you do to make things right again? The toughest and certainly the best way would be to go back to the point where you thought it went wrong. Be calm, fix it, find a new course, and act like nothing happened. You’re good. You don’t want to go back all the way? In such a case another option is to continue ahead with the new outline in your mind. Once you’re through the whole thing, you can go back and fix the portion that went wrong. Another approach to handle this situation is to go back only a little, say half, and work out the new outline. Keep yourself prepared to make bigger changes on the go and may be when you’ve caught your pace again, you can fix everything correctly. Oft times you may create characters that you thought were going to do great; all cool and heroic kinds. However, when you get to the real writing your characters do nothing more than take a bath, hang out with friends, go to their jobs, have a drink or two, and sleep. They add nothing extraordinary to your story. In fact, the numerous pages you wrote about them aren’t even a dime worthy. Keep faith in yourself and your characters. Things might just turn in an unexpected manner, and the character you thought was useless might start fitting into the shoes of a great protagonist. Out of the ordinary things they might find a conflict that is extraordinary indeed. When you do that you can dump those unworthy pages somewhere in bin. Otherwise you may find a way to chop a few pages off the character, glitter the remaining with a little alterations, and prepare the character to play the role of a good supporting character (of course, you’ve to find a better protagonist first). Do you think that people might react poorly after reading your work, or that they might put it down even before they get past the first chapter, or, worse, they would pull you down in their reviews and critics (PS: You’ll never make to that stage, for real, if your work was that bad)? If that is the case you’re clearly lacking enough confidence on yourself and your work. You might be too hard on yourself. Might be your work isn’t that bad. Anyhow, bad or good, you must keep in mind that you have many chances before this work of yours get out to the public. Get on with the first draft of your writing without losing a bit of confidence. If there are doubts—rewrite. If the doubt doesn’t go with the rewrite too, have a few people read the writing and let them provide you with a clear picture. If you receive a negative response ask them for suggestions and work in that direction, otherwise just continue ahead with the story positively (and, may be towards getting it published). PS: You might have to rewrite, re-edit many a times and even delete a massive amount of the original draft (sometimes almost the entire draft to rebuild a new one completely). I’m stuck! I just know what I want from the scene but the right word is wedged somewhere between my head and my fingers and it won’t come out. It happens all the time when you struggle to find the right word to fit the awesome scene you have in your head and your mind is restless until you have the word penned out in black or blue. The problem here is that before you continue ahead with the story you have to complete this scene, otherwise your mind just wanders hopelessly everywhere and you produce nothing but trash. What can you do? The good news is that if you’re so bothered with just a single word, it means you’ve a serious affection with the work. It is a good sign for most writers (excluding the ones who catch the wrong path and become obsessive to a fault). What you might do is think, re-think until you actually get the right word. You may even take suggestions from others. If this continues till the evening it’s alright. Even if continues for the next day, it’s quite alright. However, if that drags on to a week, you better use a filler word and continue ahead. During the rewrite you can come back and find the right word. Probably you’d have enough time and insight by that time to know the exact word you were hoping for. Sometimes you may find an idea that seems like the super idea that should lead you into writing a bestseller. However, when you pen it down it doesn’t seem half-impressive to your own scrutinizing eyes. First of all you need to confirm if it isn’t your lack of confidence talking. Even if your story doesn’t seem like the next bestseller, it isn’t a complete waste either. It may just be the catalyst to boost the chain reaction that can actually direct you to your bestseller. There are a few things you can do. Read it again, consider the idea thoroughly and correct whatever seems wrong to get on with it. Use the basic idea and weave something afresh, entirely different from this one apart from the establishing theme. Try to write a future chapter from a different point of view. You might recognize the problem and its remedy by this approach. I hope the above discussion would prove helpful to you. In the end I would like to conclude with the note that Writer’s block isn’t something that you’d be afraid of. Even the greatest authors might experience it once in a while. When tackled appropriately you’ll come out of it, all you need to have is patience and courage. Your passion will drive you to success in the end.